From the ruthless deals of the Ewing clan on TV's "Dallas" to the impeccable customer service of Neiman-Marcus, doing business has long been the hallmark of Dallas. Beginning in the 1920s and 1930s, Dallas business leaders amassed unprecedented political power and civic influence, which remained largely unchallenged until the 1970s. In this innovative history, Patricia Evridge Hill explores the building of Dallas in the years before business interests rose to such prominence (1880 to 1940) and discovers that many groups contributed to the development of the modern city. In particular, she looks at the activities of organized labor, women's groups, racial minorities, Populist and socialist radicals, and progressive reformers—all of whom competed and compromised with local business leaders in the decades before the Great Depression. This research challenges the popular view that business interests have always run Dallas and offers a historically accurate picture of the city's development. The legacy of pluralism that Hill uncovers shows that Dallas can accommodate dissent and conflict as it moves toward a more inclusive public life. Dallas will be fascinating and important reading for all Texans, as well as for all students of urban development. 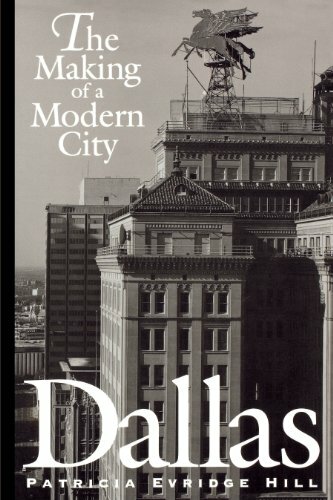 In this innovative history, Patricia Evridge Hill explores the building of Dallas in the years before business interests rose to such prominence and discovers that many groups contributed to the development of the modern city. A native Texan and former Dallas resident, Patricia Evridge Hill is Professor of History at San Jose State University in California.